● Busch started second and finished first. ● After taking the lead on the opening lap, Busch battled with polesitter Tyler Reddick for the next 10 laps. ● Busch regained the lead on lap 12 and held the position through the end of Stage 1. ● Busch reported that his No. 18 iK9 Toyota Supra was loose on entry. He pitted for four tires, fuel and an air pressure adjustment at the conclusion of the stage. ● With quick work from the No. 18 Joe Gibbs Racing pit crew, Busch held onto the lead as the first car off pit road. ● Started first and finished first. ● Busch led all 35 laps of the second stage, which saw no cautions until the stage break on lap 70. ● Still experienced a “loose-on-entry” handling condition and reported that his iK9 Toyota Supra was getting tight on exit on a long run. ● After claiming his second stage win of the race, Busch pitted under caution for four tires, fuel and another air pressure adjustment. ● Started first and finished second. ● Busch led the field back to green on lap 78, continuing his dominant run until the third caution of the race on lap 85. ● Happy with the handling of his iK9 Toyota Supra, crew chief Ben Beshore brought Busch to pit road for four tires and fuel under the caution. Busch was the first car off pit road. However, with one competitor staying on track, Busch restarted in the second position on lap 89. ● After another exciting battle for the lead, Busch was again in the lead on lap 94. He remained in control for the next 21 laps until the fourth caution of the day on lap 112. ● Pitting for four tires and fuel on lap 114, trouble with the right-rear tire slowed the No. 18 team’s pit stop. The team was also served with an uncontrolled tire penalty, relegating Busch to 13th for the lap-118 restart. ● Busch showed just how strong the iK9 Toyota Supra was, re-entering the top-five in just seven laps. ● Needing “a bit more air pressure” to get through traffic, Busch pitted for the final time under caution on lap 126. Though he gained one spot to exit pit road in fourth place, two other drivers did not pit, forcing Busch to restart in sixth. ● After going back to green with 20 laps to go, Busch worked his way into second place on lap 136 after overtaking his JGR teammate, Christopher Bell. ● Busch was unable to catch the leader over the final 14 laps and ultimately crossed the finish line in second, earning his third straight top-two result. 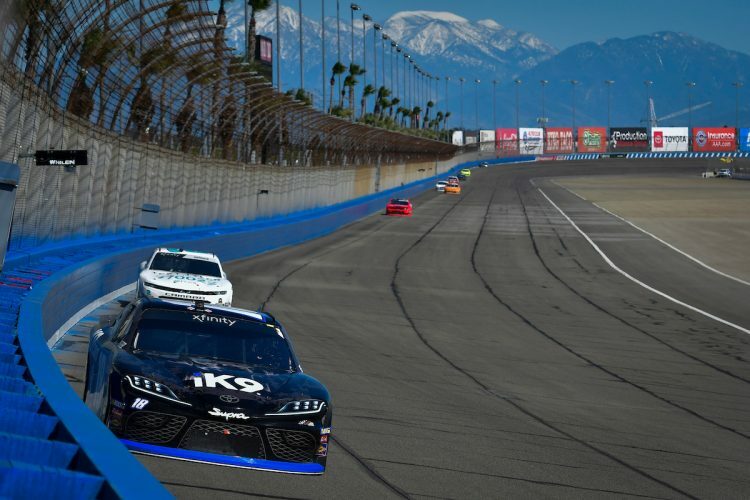 ● This was Busch’s third consecutive top-two Xfinity Series finish, following his back-to-back wins at Las Vegas Motor Speedway and ISM Raceway near Phoenix. ● This was Busch’s 13th top-five finish and 16th top-10 finish in 19 career Xfinity Series starts at Auto Club Speedway. ● The runner-up finish was Busch’s ninth consecutive top-10 Xfinity Series result at Auto Club Speedway. ● Busch led four times for a race-high 98 laps. ● The No. 18 iK9 team is first in the owners’ championship with 236 points, 16 ahead of the No. 2 team of Richard Childress Racing. ● There were five caution periods for a total of 28 laps. ● Only 16 of the 37 drivers in the Production Alliance Group 300 finished on the lead lap. The next event on the Xfinity Series schedule is the My Bariatric Solutions 300 on Saturday, March 30 at Texas Motor Speedway in Fort Worth. The race starts at 1 p.m. EDT with live coverage provided by FS1.